A new study of the registration figures of dogs of the world reveals that the Labrador Retriever is the most popular breed in the world, followed by the German Shepherd and the Poodle (all sizes included). For the most popular breeds registration figures per year worldwide is measured in tens of thousands and for a few lucky breeds even hundreds of thousands. Yet many breeds at the other end of the spectrum struggle to pass one hundred registrations per year. Almost 30 % of all FCI breeds are facing the great challenge of maintaining genetically sustainable populations while breeding within very small populations. In the autumn of 2012 Swedish show judge Catharina Hasselgren was employed by Svenska Kennelklubben (the Swedish canine organisation) to conduct a study on the total number of dogs of different breeds worldwide. Canine organisations in 37 different countries were contacted and asked to share their registration data. By the end of January 2013, 25 countries had responded to the request, and the total number of dogs in the survey responses amounted to over two million individuals. The resulting material thus consists of a large amount of data that can be of interest in various situations. Most importantly, it provides an insight into the distribution of breeds in the world and the total amount of registrations for the different breeds. Even though the data has its limitations (more about the reasons for that can be found below) some interesting conclusions can be drawn. However, before we start analysing the data more thoroughly, let’s look at some basic statistics from the material such as the grand totals and the list of the most popular breeds in the world, based on kennel club registrations. The data can be utilised to find information about many different aspects of the world’s population of registered dogs. One important aspect is of course the situation for small breeds (with regard to registration numbers). For instance, the number of FCI breeds in the data with less than 100 registrations per year worldwide is 51. This share of very small breeds is equivalent to 17 % of the breeds. Notably, some of those breeds have no registrations at all in the material. A yearly registration of 100 dogs of a breed in one country would be considered a small number in order to keep the population size and the increase in inbreeding coefficient at an acceptable level. Here we find breeds which have such a small number of registrations in the entire world. These breeds are facing extreme difficulties in terms of keeping the level of inbreeding in the individual mating, as well as the population as a whole at an acceptable level, as the already limited number of available breeding stock may well be located on different continents. One can argue that there could be strong populations of these breeds in countries which have not provided any registration data. There is also the chance that the breed belongs to those that are allowed to be crossed with a closely related similar breed. Hopefully, this is the case for some of the very small breeds. If not, many of them will risk severe inbreeding problems or even extinction. 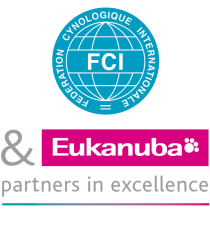 To further illustrate the extent of FCI-breeds that may be considered to belong to a small worldwide population, a total of 86 breeds show less than 200 registrations per year world-wide. This means that almost 30 % of all FCI breeds are facing the challenge of breeding in very small populations. On the other hand it is reassuring to find that the majority of the FCI breeds display worldwide populations that, if used wisely in well-designed breeding programmes, can cater for long-term sustainable breeding within the population that a breed constitutes. Another apparent conclusion from the data at hand is how important collaboration between breeders in different countries is. Dog breeding is indeed an international affair and the genetic well-being of most breeds is dependent on breeders in different countries sharing their breeding stock, thus reducing the level of inbreeding in the population of the breed in another country. To ensure the survival of the very small breeds (in terms of registration figures) for the future it is of great importance to further investigate the possibilities of using closely related breeds/varieties when breeding. Consequently there is a need to standardise the regulations worldwide for interbreeding between breeds and varieties to ensure similar possibilities using closely related breeds/varieties. Such standardisation can serve as a method to ensure that breeders in all FCI countries will have the same possibilities to plan their breeding on the same terms and to share their breeding stock with breeders in other countries. The difficulties faced by numerically small breeds should also be taken into account when new breeds are acknowledged by the FCI. What chances does the new breed have of maintaining its genetic health in a long-term perspective? Is the number of founders sufficient to form the base of a new breed? Can the new breed be acknowledged as a variety of an already existing breed? We would like to thank all counties who have kindly shared their data and thus have made this article possible: Argentina, Australia, Belgium, Canada, Chile, Czech Republic, Denmark, Germany, Greece, United Kingdom, France, Finland, Ireland, Italy, Japan, Norway, New Zealand, Portugal, Slovakia, South Africa, Spain, Sweden, Taiwan, The Netherlands, Ukraine U.S.A.
Kennel clubs in 37 countries were asked to share their data. The requests were sent to FCI members, except for countries lacking an FCI member where the request was sent to clubs who are in some way recognised by the FCI. 25 of these responded with data in some form. 23 of the responding countries provided registration data from 2011 while the remaining two provided registration data from 2008 and 2009 respectively. One country provided all registration data apart from data on German Shepherds, the figures for German Shepherds are thus lacking from one country. As registration figures are considered confidential data in some countries, individual registration figures from the different countries are not published. The data is, for obvious reasons, inconclusive. Several countries with large registration figures have not responded. Yet we believe that the data at hand can provide a valuable insight into the distribution of breeds and gives a hint on the total size of the registration figures worldwide for the different breeds. The difficulty in defining the term breed becomes obvious when working with a material from various different countries. In this article the term breed has been based on dogs registered under the same FCI number. However, dogs registered under two different FCI numbers have also been defined as being of the same breed if at least one of the countries answering the survey has registered all dogs of the different varieties as being of one breed. For instance, some countries have reported Collies only as “Collie” (FCI no 156/296), not as “Collie rough” (FCI no. 156) and “Collies smooth” (FCI no. 296).
) if you wish to contribute.